Here is another A.G. Howard book with a cover illustration that is bold and beautiful, and that I could just sit here and stare at all day long. I don't know what it is about young adult books (probably that they are in the market at present), but some of them have very eye-catching cover illustrations that just draw your attention even if you're not really looking for anything new to read in particular at that time. And The Architect of Song certainly has a very attention-grabbing illustration. I like the bold red of the girl's dress. I like the Gothic feel of the tombstone in the back. I love the nighttime setting of a cloudy dark night. I love the torn shreds of paper floating through the air. And I love the unfocused, yet hard to ignore roses just settled there on the side. 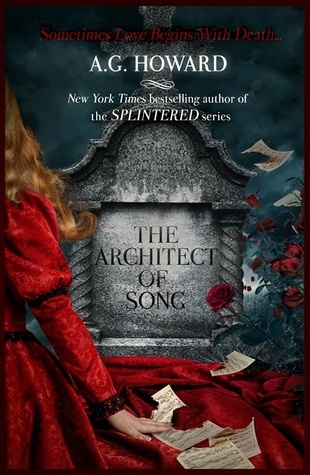 The Architect of Song is actually categorized as a new adult story--an historical, paranormal romance, and the first in A.G. Howard's newest series Haunted Hearts Legacy. It will be published on August 15, 2016.